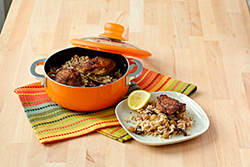 This Latin-Fusion dish combines the traditional Rice with Chicken dish with Moroccan flavors using sweet paprika, cumin, ginger, coriander, raisins, and olives! Mix first 6 ingredients in a large bowl and combine with 2 Tbsp. olive oil. Pat chicken thighs dry and coat evenly with spices in bowl. Heat your IMUSA silicone Caldero on medium-high heat and add 1 Tbsp. of olive oil. Cook both sides of each chicken thigh until golden brown, remove and set aside. In the same IMUSA Caldero, sauté the onions and garlic until soft, about 2-3 minutes. Mix in rice, raisins, olives and chicken stock. Add bay leaves and nestle each chicken thigh on top of rice. Allow to come to a simmer, cover and cook on low for 30 minutes. Remove from heat and sprinkle lemon juice on chicken and rice. Serve two thighs on top of rice and garnish with chopped parsley or cilantro. Quince is a popular Spanish paste made from Quince fruit (a cross between an apple and a pear). The delicious combination of this sweet paste with Manchego cheese create an empanada perfect for breakfast, dessert, or a sweet snack! In a medium bowl mix first 3 ingredients with your hand until it’s completely smooth. The Maseca dough will be quite loose at first, but will thicken after some time. Allow to sit for at least 5 minutes. 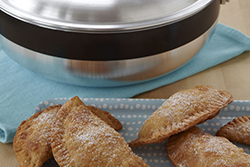 Pre-heat your IMUSA empanada maker by simply plugging it in. the meantime cut 12 thick slices of Manchego cheese, about 3-inches wide and ½-inch thick. Cut 12 slices of the quince paste about 3-inches wide and ¼-inch thick. Join each Manchego slice with each quince paste slice and set aside. Open IMUSA empanada maker and place a heaping spoonful (about ¼ cup) of dough inside an empanada mold, carefully dispersing it to each corner of the mold with the spoon. Gently place a Manchego and quince slice into the center of the dough and cover them with another spoonful of dough, assuring that the cheese and quince are completely covered. Repeat with the other empanada molds. If you over-fill the mold with the dough, don’t worry. The excess dough will press out of the mold and can be easily “snapped off” before serving. Cook for 8 minutes and carefully remove each empanada (it will be soft at first) with tongs and allow to cool for 2-3 minutes on a cooling rack before serving. 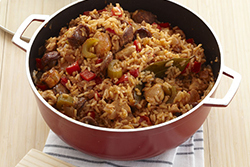 Jambalaya originated in the Caribbean Islands and is a dish made with meats and vegetables and adding stock and rice. It is a close cousin to the Spanish paella - minus the saffron. This recipe includes chicken and Andouille sausage, giving it a flavorful & delicious spice. Heat oil in your large IMUSA CALDERO to medium high heat. In your IMUSA SAUTÉ PAN, Sauté chicken and andouille sausage until lightly browned for about 5 minutes. In your IMUSA CALDERO, stir in onion, bell pepper, celery and garlic. Season with cayenne, onion powder, salt and pepper. Cook for 5 minutes, or until onion and bell pepper are soft and onion is translucent. Add the tomato sauce and cook for 5 more minutes. Add the rice, the chicken stock and bay leaves to your Caldero, bringing to a boil, then reduce heat, cover, and simmer for 25 to 30 minutes, or until rice is tender. Add the chicken and the Worcestershire sauce and stir it with hot pepper sauce. Adjust salt and pepper to taste. 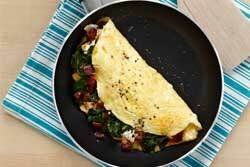 The combination of flavors from the spicy chorizo & tangy goat cheese create a wonderful omelet that will be a weekend brunch favorite! Heat 1 teaspoon of olive oil in an IMUSA sauté pan. spinach and cook just until wilted, about a minute. Drain, press out liquid and chop coarsely. Place the spinach in a small bowl. Stir in the cheese and chorizo. Blend egg, egg whites, hot sauce, salt, and pepper briskly with a fork in a medium bowl. Heat oil in an IMUSA egg pan over medium-high heat until hot. Tilt the skillet to swirl oil over surface. Pour in egg mixture followed by the spinach, chorizo and cheese mixture. Reduce heat to medium and cover. Continue to cook until almost set, and the bottom is golden, about 5 to 6 minutes. Dulce de Leche literally means 'Candy of Milk' which is why this sweet topping is a favorite in Caribbean desserts. 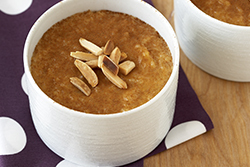 The flavor is similar to caramelized sugar and adds a unique twist to a traditional Rice Pudding Recipe! In a small IMUSA pot bring 3 cups of milk to simmer on medium heat and add rice. Lower heat to simmer for 30 minutes, mixing rice with a wooden spatula every ten minutes. In a separate bowl whisk the egg yolks, vanilla, and salt with remaining cup of milk and set aside until rice is done cooking. Slowly mix in egg yolk mixture to rice and add dulce de leche. Continue mixing until it comes back to a simmer and rice pudding starts to thicken. Remove from heat and pour into small bowls or ramekins. Garnish with cinnamon and toasted slivered almonds. 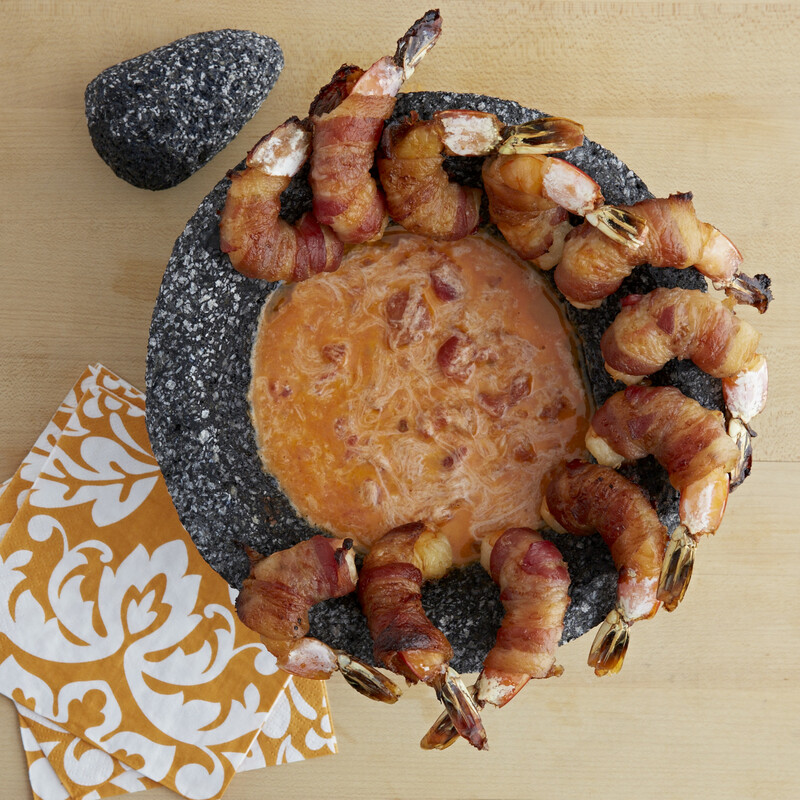 Use your IMUSA lava rock molcajete to impress your guests with this delicious appetizer! Shrimp, Bacon and Cheese!?? You cant get better than that! Enough said, start prepping! Dry shrimp with paper towel and cut each slice of bacon in half. Wrap each shrimp tightly with a half slice of bacon. Hang shrimp over the edge of your IMUSA molcajete, tail side out. Place drained tomatoes in a medium bowl and mix with the rest of the ingredients. Spoon in the center of the molcajete. Place molcajete in the center of a sturdy baking sheet and put inside the oven. Cook for 15-20 minutes or until bacon is browned and crisp and cheese is bubbly. Remove and serve with warm with baguette slices or crisp tortillas. The molcajete will be extremely hot. Tempura is the quintessential Japanese deep fried dish. We put a twist on it using Mexican beer to add a unique flavor. Try frying shrimp, sweet potato, red pepper, and asparagus! In a bowl mix 1 cup beer into flour. Then add enough beer until batter is smooth and lightly coats a spoon. There will be lumps. Mix in salt. Make several shallow cuts across the inside curve of each shrimp and press shrimp gently to help prevent curling. Flour vegetables pieces and shrimp and set aside. Heat oil in IMUSA wok until it reaches 375° F.
Working in small batches, dredge each vegetables piece until they are completely coated, and place in IMUSA wok, turning often, until golden, about 2-3 minutes. Place on drip tray. Dredge shrimp last and fry until golden brown, about 3 minutes. 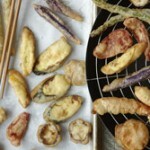 Serve tempura with dipping sauce right away. Note: You may use many other sliced vegetables for this recipe including mushrooms, zucchini, yellow squash, carrots and turnips. 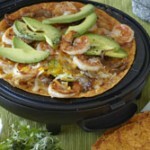 This quesadilla recipe is layered with flavors from the sweet caramelized onions to the savory seasoned shrimp. Using an IMUSA quesadilla maker, you will have perfect quesadillas in no time! In a medium skillet heat 1 T of butter and 1 T of olive oil over medium high heat. the thinly sliced onions stirring occasionally (but not too often) until caramelized. Season lightly with salt and pepper. Remove from pan and set aside. Add additional tablespoon of butter to pan and add the shrimp. Season the shrimp lightly with salt and pepper. Cook shrimp 2 to 3 minutes stirring frequently until opaque and lightly golden, remove from heat and set aside. Place 4 tortillas on a flat surface and divide HALF of the cheese among them. Next add the caramelized onion, shrimp and avocado. Top with the remaining half of the cheese, and another tortilla on top. Lightly brush the outside with a little melted butter or olive oil and place in a preheated IMUSA quesadilla maker. Cook for 4 to 5 minutes or until cheese is melted and tortilla attains a golden color and nice crisp. Add ¼ teaspoon each of salt and cayenne pepper to sour cream and stir to combine. Cut quesadillas into wedges using a pizza cutter and top with the sour cream, salsa, and chopped cilantro. © IMUSA 2018. All Rights Reserved. Powered by CMW.